As you may have known, I am a huge fan of Halloween. I am also a huge fan of Disney. So, every year around Halloween time I ask myself why do we not have any Disney Halloween decorations? Especially since one of my favorite rides at Disneyland is the Haunted Mansion. 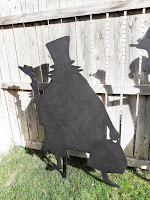 This year I decided to take care of that with these super fun Hitchhiking Ghost Silhouettes. Erik and I are not afraid to take on tasks if we think they will save us time and money. 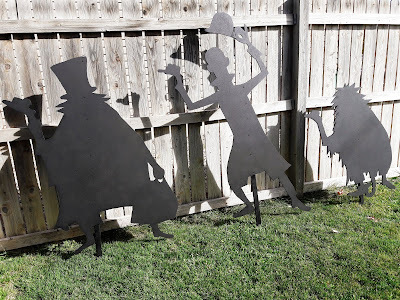 When trying to decide how we wanted to go about getting these ghosts larger than life we decided to rig our own contraption using a small print of each ghost and a flashlight, much similar to my reindeer silhouette of years past. We found this picture of the three ghost from a quick Google search. We printed it out at home and used an Xacto knife to cut them out to ensure we got all the fine details. 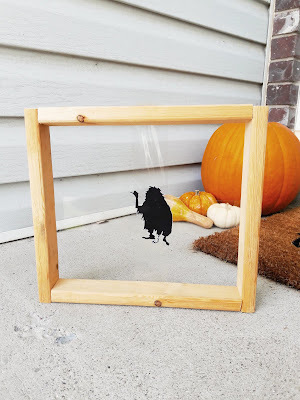 Erik created this frame from one of the strip boards. 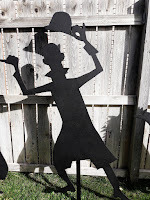 We taped each silhouette of the ghost in the center and placed a flashlight behind to create a shadow. Making sure our particle board was standing straight, we traced the shadow with a pencil onto it and fixed any mistakes afterwards. Then we retraced the outlines with a permanent marker. 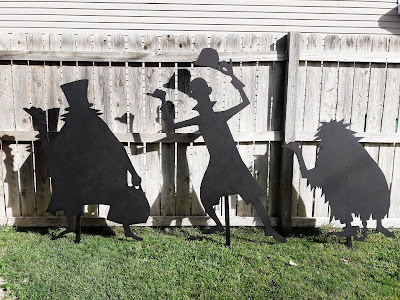 To save yourself the time you can take the picture of the silhouettes to a local copy shop and they can enlarge and print them for you. This will also ensure you have precise outlines. Cut out the enlarged images. Tape them to your plywood and trace with a permanent marker. 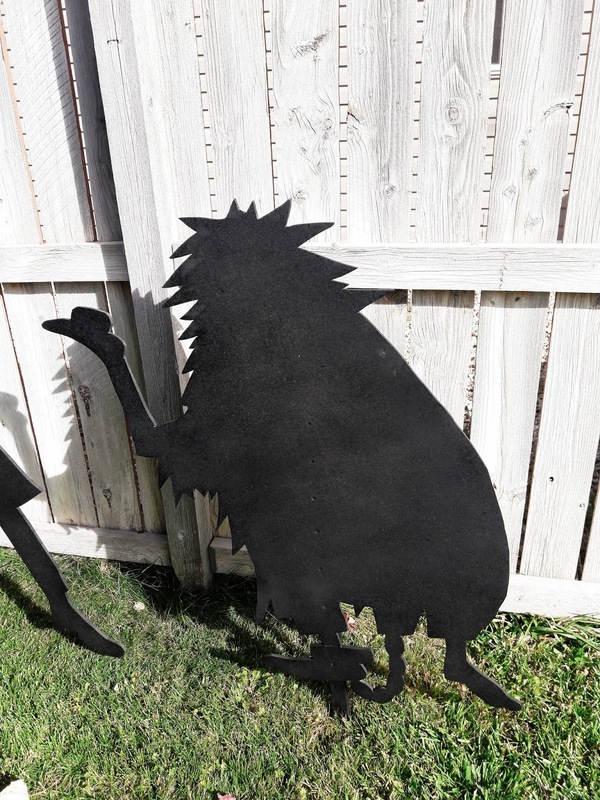 Once your outlines are traced from either method cut them out with a jigsaw. Sand down the rough edges. Cut one end of the strip boards to a point to create a stake. 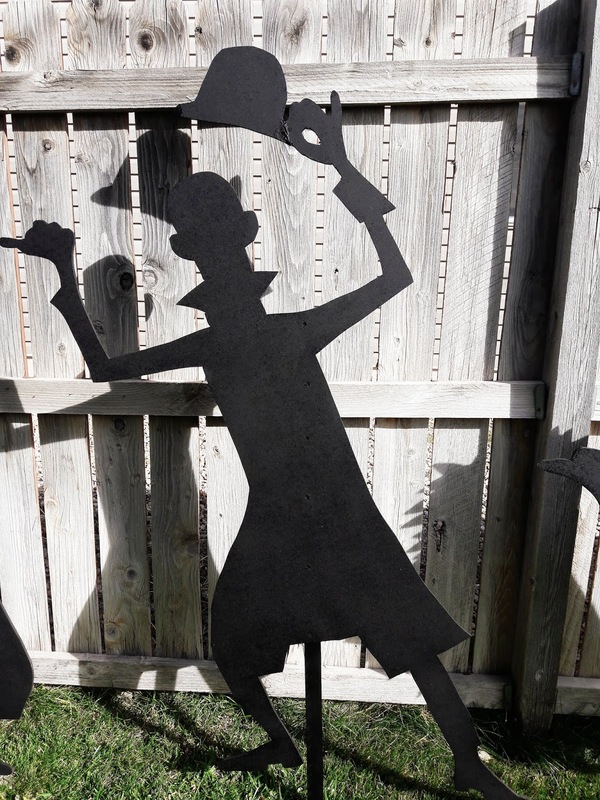 Carefully apply your stakes to the back of the silhouettes with the screws. 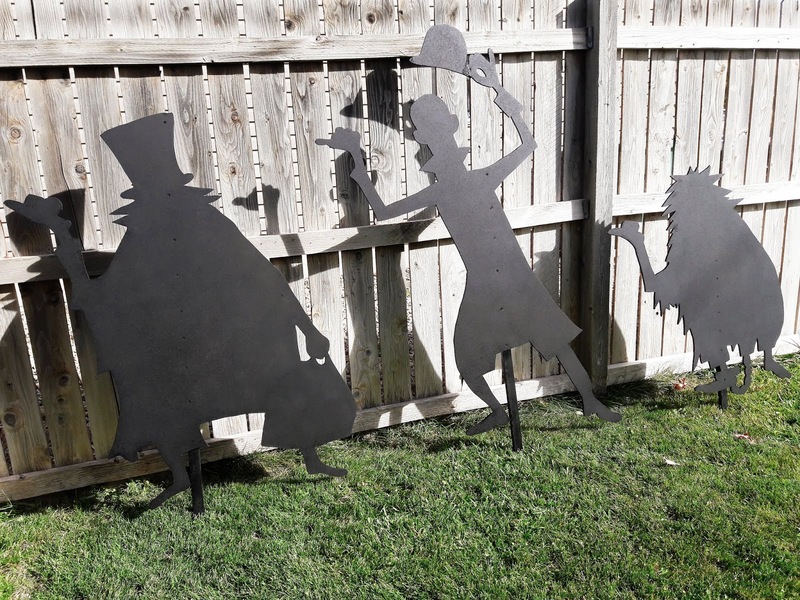 We applied the stakes to the side of the silhouettes as the ghosts have a leaning posture. Spray paint the silhouettes black. Apply additional coats if needed, I ended up doing three. 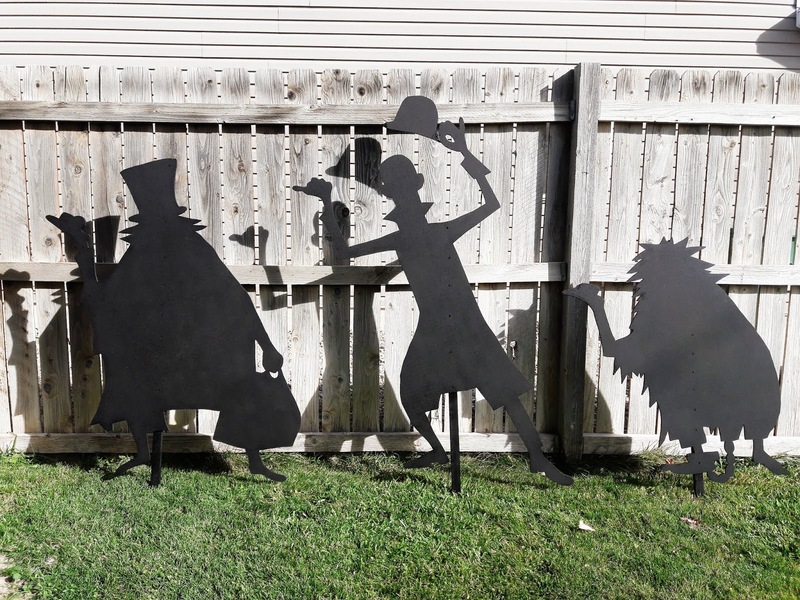 Place silhouettes in your yard. I think this might be my favorite project we have completed to date. Probably because it is a combination of two of my favorite things. 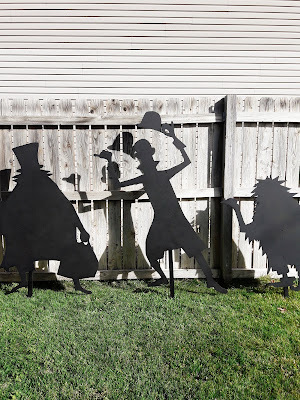 I am so excited for trick or treaters to see these on Halloween night. And they will last for years to come! 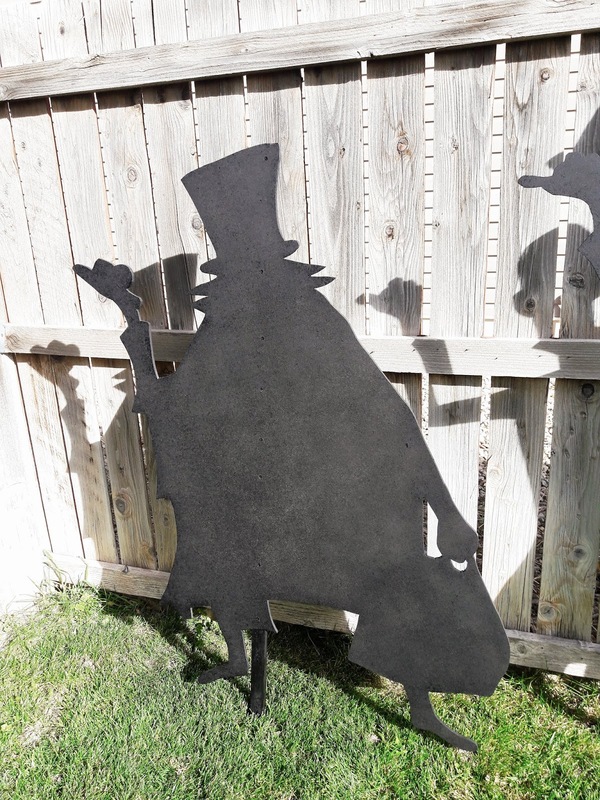 What is your favorite Halloween decoration at your house?